Oil palm development in Indonesia has led to conflict, human rights abuses and the theft of community land; it has sparked massive fires which devastate forests, contribute significantly to climate change and affect human health. Yet the continued international demand for palm oil from the food, cosmetics and now energy industries means that these impacts are likely to persist, as Indonesia pushes ahead with the expansion of oil palm across the archipelago. After a hundred years of the crop in Indonesia, it is clear why this expansion should stop now. Indonesia has had oil palm plantations for a century now – since the opening of the first commercial plantations on the east coast of Sumatra (Deli) and Aceh in 1911.Today, Indonesia is the world’s largest producer of palm oil, with an oil palm plantation area of ​​8,036,431 hectares, spread across almost all provinces. It was in the 1990s that the oil palm boom really got underway, but the ground was prepared in the decade before. During the 1980s, the World Bank and the ADB funded several oil palm plantation projects, coupled with support for the Indonesian government's transmigration programme. Supporting legislation ensured that poor families from Java, Bali and Madura were moved to Kalimantan, Sumatra and other targeted ‘outer islands’ to open up forest areas and as a cheap source of labour for industrial plantation companies, while financial incentives were offered to oil palm companies. 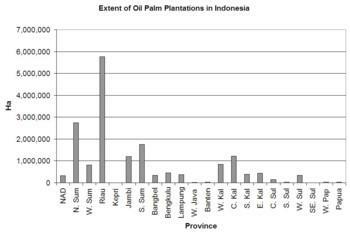 By the end of the Suharto period in 1998, the total estimated area planted with oil palm plantations had reached 2.5 million ha. The palm oil industry became increasingly dominated by giant conglomerates – some still dominant today. Four Indonesian groups - Astra, Salim, Sinar Mas and Raja Garuda Mas - controlled two-thirds of private estates by 1997. In the new century the rapid expansion continued at the expense of community livelihoods and forests. Concern over impacts prompted the setting up of the Roundtable on Sustainable Palm Oil (RSPO)and just last year the Indonesian Sustainable Palm Oil but for people living in areas targeted by plantation developers, these initiatives have yet to effect the far-reaching reforms needed to protect rights to land and livelihood. A large part of Indonesia’s palm oil production is destined for export. While the value of the exports has fluctuated, the volumes have seen huge increases in recent years. India (33%), China (13%) and the Netherlands (9%) are the main destinations for Indonesian palm oil.According to data from the World Bank, China and India are estimated to consume about 27% of the 47.26 million tonnes of palm oil globally available in 2009/10. The need to reduce reliance on fossil fuels, and rocketing oil prices,are helping to drive the high demand for vegetable oils, in addition to its use in food and cosmetics. Now vegetable oils as agrofuels feedstock are in demand as a substitute for fossil fuels. This provides an incentive for Indonesia to maintain its position as the world’s largest producer of palm oil, expand its oil palm plantations and guarantee the supply of palm oil to international markets. Of the 10.25 million ha of additional land designated for agrofuel development by 2015, 4 million hectares will be dedicated to oil palm. In addition to the demand for agrofuels, the expansion of oil palm plantations is also being promoted by the Indonesian government as an answer to climate change. The Ministry of Agriculture is planning to expand oil palm plantations on non-forested land by ​​868,675 ha by the year 2014, as part of climate change mitigation efforts (see table). Indonesia’s success story as the world’s foremost palm oil producer with large fortunes earned through the sale of palm oil, is not matched by a similar success story for local communities, indigenous peoples and smallholders. Instead, the development and expansion of plantations under the current system has brought impoverishment, human rights abuses, environmental degradation and conflict – especially over land. The acquisition of public land is typically carried out using one or both of two approaches: persuasion and violence. The first approach sees the company in question try to persuade people to hand over their land. To do this, the company makes promises about increased prosperity through the provision of jobs for rural communities, about paying a decent wage, turning the farmers into profit-making smallholder participants on company plantations, and about building infrastructure and amenities needed by the village, such as schools, health facilities and roads. Almost all those promises are never fulfilled. When this approach fails to get communities to agree to give up their land, the company will usually resort to coercion or violence, for example applying pressure through village officials or the police, or employing the services of thugs in order to intimidate the community. DTE has highlighted many cases of abuse related oil palm development over the past two decades. People have had to flee from their villages to avoid arrest by the police for refusing to hand over their land while others have been tricked into schemes where they are treated little better than slave labourers.A 2007 investigation by the International Crisis Group revealed chronic prolems with existing plantations in Boven Digul, Papua over land rights, access to resources and the inlux of non-Papuan workers. The same year, the Insitute for Papuan Advocacy and Human Rights reported how tension exploded into violent clashes in the same area.In 2010, Sawit Watch recorded more than 663 communities in conflict with more than 172 companies, and 106 arrests as a result of such conflicts. Last year Indonesia’s Forestry Ministry admitted that only 48 million hectares of the country’s forests were in good condition, from a total of 130 million hectares classified as forests. A calculation by Forest Watch Indonesia (FWI) based on satellite imaging, A calculation by Forest Watch Indonesia (FWI) based on satellite imaging, gives the figure for forest cover (primary and secondary) as 87,552,134.49 hectares in 2009 or 31,13 per cent of the country's land area. 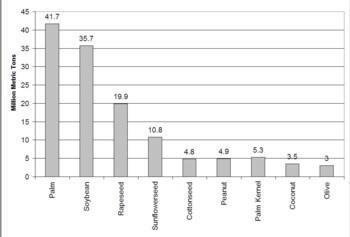 This is 46% less than in 1950 when 162.29 million hectares covered 84% of the land area. The first wave of deforestation followed the 1967 forestry law and the awarding of 20-year forest concessions (HPH) to logging companies. From 1969-1974, almost 11 million hectares of HPH concessions were handed out in East Kalimantan alone. The clearing of forests for transmigration sites, the extractive industries, agriculture and, in coastal areas, aquaculture, also took a heavy toll on the forests. 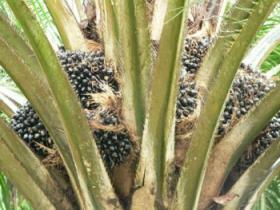 Then came oil palm. Estimates of forests cleared for oil palm plantations vary but there is no doubt that this crop, along with pulpwood, has been responsible for a large portion of deforestation over the past two decades. As oil palm plantations were expanded even further, from around 3 million ha at the turn of the century to the extent they cover today (over 8 million hectares) companies cleared more forests and took over land belonging to indigenous peoples and local communities. In 2006, research by the Indonesia Forest Climate Alliance (IFCA) and Forestry Ministry estimated that 70% of the 6 million hectares of oil palm plantations at the time had been developed by clearing forests.Independent research by Sawit Watch and FPP in 2006 put the figure much higher: 18 million hectares cleared for oil palm plantations - though only a third of this amount had actually been planted. Plantation developers were also largely behind the catastrophic forest fires of 1997/8. Burning was seen as the cheapest option to clear forested land to establish large scale plantations. Of the 176 companies accused of burning to clear land at the time, 133 were plantation companies.Almost 4 million ha of agricultural land, over 3 million ha of lowland forest and 1.5 million hectares of peat and swamp forest were burnt in 1997/98. An estimated 75 million people were affected by smoke, haze, and the fires themselves. The economic costs were estimated to be between US$4.5 billion and US$10 billion. The expansion of oil palm is set to continue. According to research by Sawit Watch and FPP, already in 2006 regional governments were targeting a further 20 million hectares by 2020. Large tracts of forests and peatlands are targeted for development in plans for Papua, Riau, Kalimantan, Aceh and other regions. One mega-plantation scheme planned for the Indonesia-Malaysia border area in East and West Kalimantan covered 1.8 million hectares of land, much of it forests. Oil palm plantation plans targeted 3.5 million hectares in total in the province. Central Kalimantan has also seen its share of deforestation for oil palm plantations. A FWI report in 2007 found that of the 2,367,487 ha allocated, more than a third was still forested. Plantations were being opened on peatland here, with 14% of the 3 million hectares of the province’s peatland already converted to oil palm. Papua and Aceh are also targets for further expansion. By 2006 Aceh had over a quarter of a million hectares of the crop and the new provincial government was planning an initial further 185,000 hectares in 17 districts. Meanwhile, the year before, Jakarta had stated that 454,468 hectares was available for new oil palm developments in Aceh.In 2007, targets of between 1 and five million hectares were announced for Papuamuch of this expected to be in Papua’s 9.3 million hectares classified as ’conversion forest’. On top of the human rights, health, livelihoods and biodiversity impacts, the climate change impacts of oil palm development are enormous, especially as much oil palm development is taking place in carbon-rich peatland areas. Emissions from deforestation of forests and the draining or drying out of peatlands are to a large extent responsible for Indonesia’s ranking as one of the top greenhouse gas emitters globally. The 1997/98 fires alone accounted for more than 700 MT of CO2, or 40% of the total global emissions from burning fossil fuels that year. In 2006 IFCA estimated oil palm’s emissions from forest clearance between 1982 and 2005 at 2117MtCO2 (above-gound emissions only), but noted that further emissions had been caused by ’bogus oil palm developments’ used to aquire timber clearing permits. According to research by Patrick Anderson and Torry Kuswardono in 2008, permits have been issued for the conversion of about 4 million hectares of peat forests for oil palm and pulpwood plantations in Riau, Central Kalimantan, Jambi, Papua and West Papua. The consequence of clearing and draining these forests will mean Indonesia’s annual CO2 emissions will increase by another billion tonnes and continue at that level for decades. See DTE’s 2002 report Forests, People and Rights for more background. See DTE 82:9 for more information on Sinar Mas. See, for example, DTE 68, February 2006 for background. Bapenas & Direktorat Pangan dan Pertanian. 2010. Kebijakan dan Strategi dalam Meningkatkan Nilai Tambah dan Daya Saing Kelapa Sawit Indonesia Secara Berkelanjutan dan Berkeadilan. Mat Cutik from Talang Nangka village, South Sumatra was forced to flee his v illage because he was leading opposition to oil palm plantations – See DTE 73. This was also experienced by women, see DTE 74. See also Pak Suroso’s story in DTE 87. See report in DTE 75:2. The figures are different according to source and calculation methods. According to the government and World Bank, between 1985 and 1997 Indonesia lost almost 20 million hectares of its forest cover. In 1985, forests covered 119,700,500 ha and in 1997, 100 million ha. Estimates by Forest Watch Indonesia/Global Forests Watch put the figures lower, at 117,191,550 ha in 1985 and at 95,628,800 ha in 1997. In 2003, Forestry Department figures showed forest cover extending over 94 million hectares. Meanwhile, calculations by the Environment Ministry using satellite images from 2004-2006, put forest cover at 83 million hectares, (though the notes say that 33 million ha cannot be identified due to cloud cover). In 2005, the FAO put the figure at 88.5 million ha. For more general background on forests see DTE’s 2002 Special Report Forests, People and Rights. Indonesia Forest Climate Alliance & Ministry of Forestry, REDDI: Redd Methodology and Strategies, Summary for Policy Makers, 2007. See DTE 35, 1997, Special Supplement on the Fires. See DTE Special Report, Forests, People and Rights. Indonesia’s emissions are estimated at 3 billion tones of CO2e per year. See, past issues of DTE on this, eg DTE 84, March 2010. See DTE 71:7 and 71:16. Patrick Anderson and Torry Kuswardono, Report to the Rainforest Foundation Norway on REDD in Indonesia, September 2008.